BOATS LIMITED TO 23 FT., PARKING FOR TRAILER IS LIMITED AT OVERFLOW PARKING AREA. PLEASE REVIEW IN ADVANCE WITH US, IF YOU INTEND BRINGING YOUR BOAT PRIOR TO MAKING YOUR RESERVATION. WE WANT TO ENSURE YOU COMFORT AS WE CONFIRM THIS IS THE CORRECT DESTINATION FOR YOU. Wide Open Water Views, with Cozy Trailer on Property... a 2018 Coleman, 27 FT.
PELICAN HARBOUR is a Great Property you are literally on the Water, step out and Wide Open Views, Exterior Stereo, Chaise Lounges, Seating Area and BBQ Outside (we do not provide the Propane). We have a Tiki Parasol for outdoor shade. Fish from the Water's Edge. Parking for your Vehicle is in front of the Property. 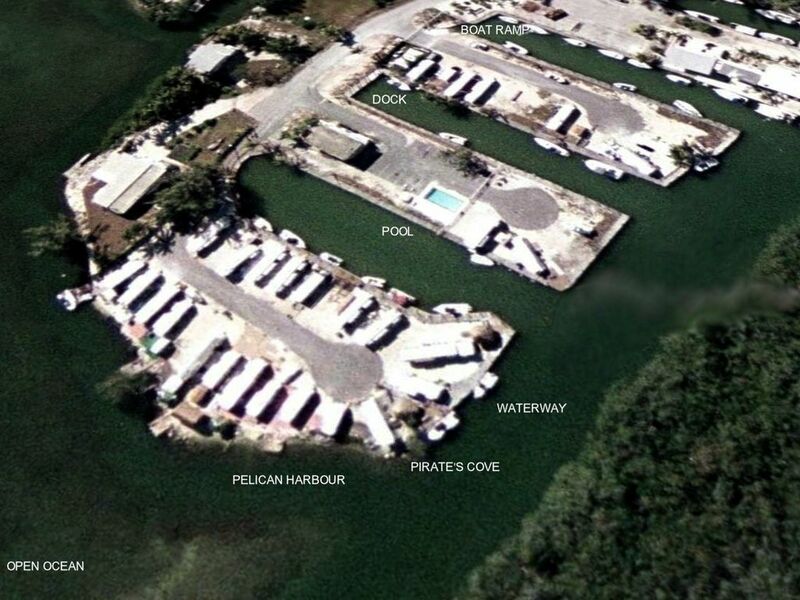 If you are bringing a Boat it can be kept at the adjacent Peninsula, we we have a 30 Ft. assigned Dock space. BOAT MAXIMUM IS 23 FT.
For Launching of your Boat, there is a "small" Community Boat Ramp which is Free. Parking for your Trailer is provided, space being available on the Public Swales. We do have a Community Pool ( Not Heated) which is on the adjacent Peninsula; 45 Sec. walking distance. The experience with us is a bit more Personal and Service Oriented, we will meet you on the Property upon arrival and get you settled-in and show you how everything works, the HVAC, the Stereos, Satellite T.V., the BBQ (we do not provide the Propane), Stove, the Range, and in-turn answer any questions you may have. The Property is extremely peaceful, and quiet, this is a Gated Community. Along the Waterway you may even see some Manatees or Dolphins swimming by, lay in the Chaise Lounges, and hear the Coconut Palm frontons move in the breeze. Otherwise you can ask Ann for one of her Freshly Cooked Crab Platters, she will deliver it by Boat and serve it Dockside. While in Downtown Key Largo, Boat Charters, and Fishing Trips are available. Kayaks can be kept at the Property. Markets and Shopping are less than 10 Min. away, we provide Discount Cards for WINN-DIXIE one of the Local area Markets. For Beaches, John Pennekamp, a National Park, is 10 Min. away at MM 102, OCEAN SIDE (Left Side). Traveling South look for the Overhead Sign. Great Beaches, with snorkeling opportunities. there is also Group Fishing which is not expensive, or Snorkeling Trips to the Reefs a little off-shore. For Laundry facilities we offer, Island Coin Laundry, at the Office Depot Shopping Center. Key Largo, Florida Chamber of Commerce, This is the Chamber of Commerce site, of which we are a Member of and does offer a myriad of endless possibilities depending on your interests. Group Fishing, snorkeling, restaurants, and other destinations. This is the site we recommend, to explore Boat Rentals and Charters. To belong to the Chamber, vendors need to have some basic credentials and reputation. If you are Renting a Boat, we recommend photographs be provided with your Agreement in advance, and as part of your Agreement should be included, if the Boat Photographed as being your Boat, is not available upon your arrival, you reserve the right to cancel. If you do not approve of the alternate Boat being offered. Very important also, will be for you to look at whats the breakdown policy if at sea. (i.e. Towing and response time, replacement boat, etc.) It also may be easier for you to have the Boat delivered to the Property, the majority of these vendors will trailer and recover the Boat from your Property. This alleviates you from having to Navigate through unknown waters, and canals. From the Chamber of Commerce, is where we get the Brochures, we keep at the Property. We recommend you book in advance for any feature destination in the Keys, as there are often discount offers for "in-advance" reservations. And with items like swimming with the Dolphins or Sea-Lions at Theater of the Sea, they book quite in advance, due to the demand. DECEMBER 20, 2018 THROUGH MARCH 31, 2019: ONE (1) WEEK MIN. CONTINUOUS TO EXISTING RESERVATIONS. BRING YOUR CELL PHONES. THERE IS NO TELEPHONE AT THE PROPERTY. PATIO AREA OUTSIDE WITH SEATING FOR FOUR. COMMUNITY POOL AVAILABLE FOR GUEST USE. NOT HEATED. The camper is just as described! Would definitely stay again. The location was perfect for us! Quiet and safe area, camper was clean as well as the grounds. Parking was a bit tight but other than that this place was perfect! We will for sure stay again! What a great quiet get away! Camping on the ocean! Doesn’t get any better! We loved it! The sunrise views were amazing! The camper was just enough room for my husband and I. We are avid campers back home so the amenities what we are used to! We loved how quiet and private the lot was. The parking area was a tad small-but our rental convertible fit just fine. We will be back next year with our son!! fun neighbors lucky as very close. windy off the water in Feb if you've had cataract surgery be prepared to protect your eyes with more than sunglasses. In our 80's so probably more rustic than expected. Had fun though. Affordable Ocean Front Glamping (Camping). The perfect start to for a day in the Keys. My wife and I have a permanent camping (glamping really) site in Wisconsin where we spend about 60 days hunting, fishing, and loving everyday. We close camp each year in November and this year needed a much warmer location to spend our December wedding anniversary. We found this great property on VRBO and Nestor took care of the rest. The property is located just beyond mainland Florida not quite 80 miles from Ft Lauderdale-Hollywood airport. It is another 7.5 miles down Hwy 1 to the Winn Dixie store where we picked up all the supplies we needed for our vacation. Mile marker 0 in Key West is 113 miles (and a cool drive might I add). The trailer is backed up to the water and very private given there is a trailer on each side of this one. Nester has done a great job carving out seclusion in a rather crowded neighborhood. The entrance to the neighborhood is gated and the neighborhood was quiet and clean during our entire stay. We found ourselves leaving the back window open to allow the ocean breeze and sounds to come in. The accommodation was a nearly new slide-out travel trailer. Everything in the trailer worked well. For some reason the water heater was not turned on upon our arrival, but Nestor came as soon as we contacted him to turn it on. Two electric heaters were provided for the cool winter days and the air conditioning worked well. A coffee maker and toaster oven are provided but a hair drier is not. The kitchen was well stocked with plates, glasses, and many other odds and ends from frequent use. There is a TV with DirecTV service in the main living area of the trailer. The bed was very comfortable and we slept very well. The sofa pulls out into a bed making max occupancy four, but three would fit more comfortably. All-in-all we had a great time and made many memories traveling from Key Largo to Key West during our stay. It was perfect for just the wife and me. The location was drop dead gorgeous. The Dwelling was adequate. The air conditioner, which is neccesary, was really loud. Could not hear the TV when it kicked on. Need a few more glass' not just plastic and a spatula would have been nice. It was clean and comfortable. Recommend highly. Other Activities: Shopping, boating, wildlife viewing, kayaking. $90.00/Night $90.00/Night (3 night minimum) $630.00/Week $2,500.00/Month 12.5% State of Florida & Monroe County Taxes $80.00 Cleaning & stocking added on all bookings. $250.00 Refundable Security Deposit collected on all stays. Security Deposits Returned 7 - 10 Business Days after Departure 25% of total required to reserve calendar; Balance due 14 days prior to arrival.